I met Gale Massey eons ago at a writing workshop, and we bonded over our shared passion for wicked humor and self-deprecating sarcasm. We just *got* each other. She’s a writer’s writer, the kind of wordsmith who gnashes her teeth over sentence flow. I love that. She was hugely supportive during my book launch, and in the midst of it, sent me a passage from her novel-in-progress. I was blown away. She and I had also bonded over a love for dark, gritty stories full of despair – books that punch away at the heart and keep the reader from doing anything other than turning the pages. She was writing just such a book. Gale’s book tells the story of 19-year-old Jamie Elders (Rooney Mara) and her younger brother, Toby, who’ve been ushered into adulthood by their abusive uncle Loyal (Billy Bob). Loyal had agreed to take custody of them while their mother served time in prison, and he has raised them in a lifestyle capped by booze-filled nights and hungry days. Their mother, Phoebe, is free now, but cobbling together a meager existence with a waitressing job at the local diner and a dreary one-room apartment. Jamie has been taking a couple of college classes and working for Loyal, who runs a fleet of illegal slot machines across the county. She also deals cards at the smoky, drunken poker games he hosts. One night, she asks her mother to deal in her place – and when Phoebe Elders throws the game, it hurls everyone into a web of violence and deceit that threatens to trap Jamie in her bleak hometown forever. The tale is set in Blind River, New York, a fictional small town adjacent to an Indian reservation where a massive casino, rising gaudily from the surrounding woods, attracts gamblers from all over the region. It’s wintertime, and Jamie often traipses down roads slushy with ice and blurred by wind, the kind of weather that seeps under your clothes and chills you to the bone. The very first sentences of the very first chapter: Jamie shielded her eyes from a gust of wind blowing down the street and crossed the dirt yard in front of her uncle’s trailer. A beagle huddled against the night air in the back of a pickup lifted its head and whined, but Jamie had nothing to feed it…The air inside was thick with smoke and the smell of beer and whiskey. The wind from outside lifted her uncle’s ball cap, but he caught it and said, “Shut that door before everything goes flying.” Now that sets a tone. Jamie exists precariously atop the underworld of high stakes gambling – poker games played in smoky, dingy rooms with dealers who mark cards, and slot handles pulled by zombie-faced hopefuls with cigarettes about to burn their dried, cracked lips. She wants to use this dicey world to catapult herself into a better place – but the trappings of her frightening reality, steeped in crime and hopelessness, keep pulling her down. 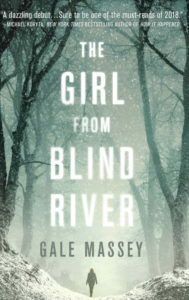 I’m not a fan of book reviews that spoil storylines and divulge too much plot, and anyway, The Girl From Blind River has more twists and turns than the backroads on which it’s set. The novel’s major themes – despair, abuse, poverty, family – are threaded so seamlessly into the characters and their lives that the story honestly feels like a lesson for people who need schooling on America’s culture wars. It can be hard to read about this stuff. Statistics and facts paint a more palatable picture of modern economic struggles. But when you put reality in a great writer’s hands, she creates a vibrant, luminous picture which can show rather than tell a reader the truth. Jamie Elders is a fictional character, but her life is all too real, just as being raised in poverty is all too common. You might not like all of Blind River‘s characters, but by the end of the book, you’ll sure understand them. The introduction to the world of high stakes poker is a great bonus. I loved my friend’s ability to conjure up the feel of the cards, the sounds of the shuffle, the way a dealer can tag an ace or slip a card literally up her sleeve. I’m not a gambler, but I could feel my adrenaline ebbing and spiking along with Jamie’s. It didn’t make me want to gamble – but it did make me want to immerse myself into this world for the span of a few hundred pages. And it definitely made me excited to see what Gale Massey is going to write next. What wonderful news for Gale! I just bought it. Thank you for promoting her novel. You just put me on a great new read. I am off to the bookstore. Yay! I think you’ll love it!! Miss you. I can’t wait to read it – it’s on my desk once I finish my current read. So proud of you both! Well, three times! I can’t argue with that….but it’s pretty damn good! xoxoxo love you, silly girl. Previous post I knew lots of Brett Kavanaughs. They don’t belong on the Supreme Court, either. Next post Middle school, now and then. WARNING: flashbacks.